Cocos Island National Park covers primarily a marine ecosystem, globally significant for sharks. 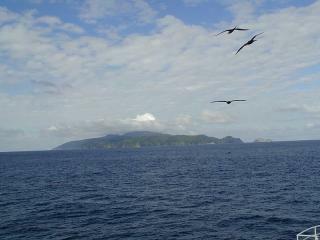 The park consists of Cocos Island and its surrounding marine zone. It is located in the Pacific Ocean 550km off the coast of Costa Rica. It is the point of land nearest to the Galapagos Islands, which lie 630km to the south-west. The marine area is considered a safe haven because commercial fishing is not allowed. 300 species of fish are found, including large species such as sharks, rays, tuna and dolphins. This also makes it one of the best scuba diving spots in the world. Cocos Island is uninhabited except for park rangers. It differs from neighbouring islands because it is not dry and barren, but covered with a humid tropical forest. It is also mountainous and there are many waterfalls. Although its ecosystem has been severely damaged by introduced species like pigs and rats, it still contains many endemic species (for example three species of endemic land birds). Prison: AB: "The human historical record includes ... use of the island (1872-1874) as a prison"
Tunnels: Over the years Gissler dug a complex system of underground tunnels there in his treasure hunting, some of which can still be entered even today. Orchids: "Five species of orchids have been recorded. Three of them are endemic, all belonging to the genus Epidendrum." Sea Stacks: Cocos island is surrounded by several islets, some of them like Manuelita island, isla Pájara and "the moais" rise quite abruptly from the sea. Formerly inhabited islands: August Gissler a German adventurer and treasure hunter was made "Governor" of Cocos Island by the Costa Rican government in 1897. Backed by Financiers who set up the "Cocos Plantation Company" he established a colony there together with "several settler families who also grew tobacco" (Wiki). Unsuccessful he eventually left the island in 1908. Buried treasures: The Treasure of Lima, en route by ship to Mexico in 1820, was stolen by the captain and his crew and was supposedly buried there. Since then, many searches have failed to discover it! Piracy: AB: "The human historical record includes pirates..."
Tobacco: Several settler families who grew tobacco also lived with Gissler on the island. Built or owned by Germans: August Gissler was allowed by the Costa Rican government to establish a colony there in 1897.